To turn on breaks, set the minimum shift your company allows before a break can be taken (settable from 3-8 hours), input the default break length for your company, and then instruct your employees to sync their Timesheet Mobile app to update their settings. 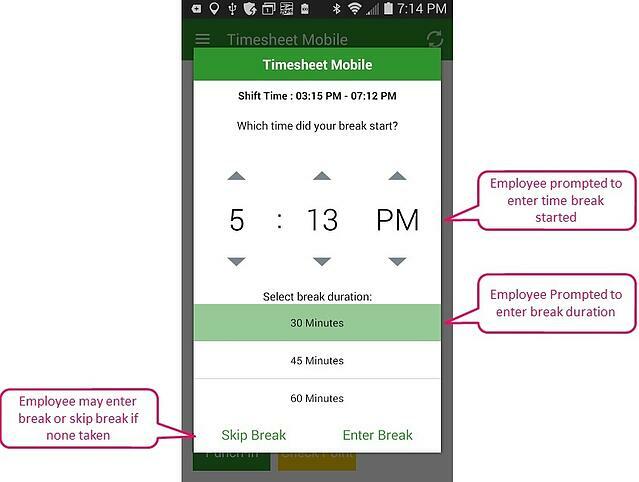 After syncing to receive the settings, employees who work a shift longer than the minimum shift specified will receive a Break Prompt on their smartphone, where they can manually enter the start time. Employees are able to override the default break length (if they took a longer or shorter break) and also have the option to “Skip Break” if they did not take one. Break Prompt requires a minimum version of 19.6 for Android and 8.0.0 for iPhone users. 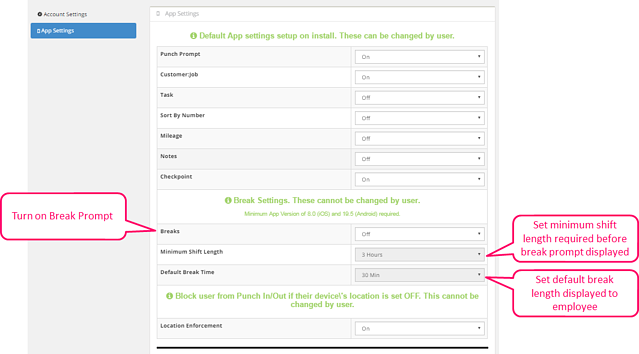 To enable Break Prompt for your employees who use the Timesheet Mobile smartphone app, navigate to Account > Settings > App Settings and scroll down to Break Settings as shown below. Contact Timesheet Mobile support if you have additional questions about Break Prompt.